President Obama: "I'm confident that Craig is the right person for the job"
WASHINGTON (CNN) -- President Obama plans to nominate Craig Fugate, director of the Florida Division of Emergency Management, as the next administrator of the Federal Emergency Management Agency, the White House said Wednesday. Craig Fugate has been director of the Florida Division of Emergency Management since 2001. Fugate is expected to join Homeland Security Secretary Janet Napolitano at an event Thursday in New Orleans, Louisiana. "From his experience as a first responder to his strong leadership as Florida's emergency manager, Craig has what it takes to help us improve our preparedness, response and recovery efforts, and I can think of no one better to lead FEMA," Obama said in a statement. FEMA -- part of the Department of Homeland Security -- was severely criticized for what many said was a slow and ineffective response to Hurricane Katrina in 2005. In October 2001, Gov. 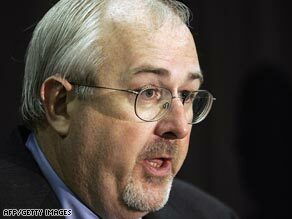 Jeb Bush appointed Fugate as director of the Florida Division of Emergency Management. Gov. Charlie Crist reappointed him in December 2006. During his tenure, Fugate has coordinated the state's response to 11 major disasters. Fugate received significant national exposure in a series of news conferences when hurricanes Charley, Frances, Ivan and Jeanne hit Florida in 2004. "[We are] very glad that someone of Craig's expertise and experience has been nominated," said Karen Cobuluis, a spokeswoman for the National Emergency Management Association. "He is eminently qualified to hold this position."